“Covenant House” NYC’s, “Sleep Out” March, 2014! “The Covenant House’s” “Sleep Out” Young Professionals edition, took place last night, Friday, March 21, 2014. In five cities across North America, approximately 400 young professionals raised $250,000.00 while raising awareness for homeless teenagers by sleeping outside on the pavement in the facilities parking lot on cardboard boxes and sleeping bags. FACT: There are approximately 1.6 million homeless teens across the US yearly. 40% of the homeless population is under the age of 18. INFORM: Teach teens, who may be going through unfortunate circumstances, that there ARE OTHER OPTIONS besides the streets. LEARN: “Covenant House” was established in 1972, serves over 400 homeless youth daily and 6,150, annually. When a teen arrives at their door, they are accepted inside. Whether they were kicked out of their home, abused by a family member, or just coming in out of the cold, and off the streets or out from the subway system. The attempt is made to reunite the teens with their families, and if that is impossible, they may be transitioned to long term living programs, with the intention for them to gain independence. The “Covenant House” also offers services to homeless pregnant women, and mothers with children, providing health services, counseling, employment training, and parenting skills. The program provides a full day nursery for infants and toddlers while their parents attend school, vocational training, or are at work. LOCATION: “The Covenant House” is located on 41st and 10th Avenue in NYC. 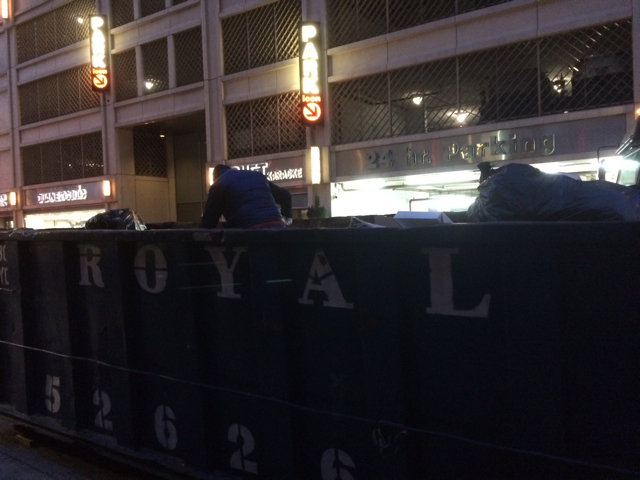 So, with that being said, here is the documentation from my experience at the “Covenant House’s” ‘Sleep Out’ event held on Friday night, March 21, 2014 from 7pm to 7am on Saturday morning, March 22, 2014. 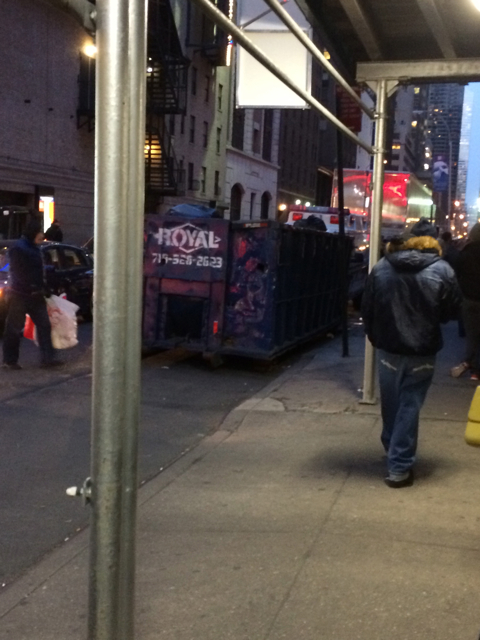 Friday at 5pm: Two hours before the event: As I was walking through Times Square heading West on 42nd Street, I was looking around at the urban setting and at the people and thought about how even the Elmo actors have anger management issues and are frustrated with life. I thought, this is not going to be like camping in the woods (albeit, a different type of peril), this is going to be different. At 4am when the bars close, people get rowdy, and this could potentially be dangerous. I was wondering if I was going to be able to sleep at all, or would I be up all night. Rather than talking myself out of it, I thought, go and check it out, and if you don’t feel comfortable, you can leave. So, I went into the bathroom of a coffee shop, put my leggings on under my 40 degree running pants, and headed over to the center. Now that warm attire was addressed, how about safety and security? I looked around and saw that there were many facilities that are open 24 hours; pharmacies, hotels, bars, and urgent care centers, all within a few block radius. This made me feel better. When I arrived, I registered my name and asked how safe it was. After hearing “we have never had any incidents, the security guards will be at the entrance all night, and the police will be making extra rounds,” I began to feel less nervous, signed the waiver, and was given a badge. The volunteers and staff seemed very professional, kind, upbeat and positive, much like many other people I have worked with in other social service arenas. The negative thoughts were instantly placated. 7pm: The sleepers were directed inside to a warm conference room, catered with trays filled with sandwiches, veggies and cheese, chips and non-alcoholic beverages, and restrooms. 7 to 8:30pm: Registration, networking, music, social media centers, and dinner. Gratefully, another young professional female “sleeper” approached me and we started discussing our experiences of getting dressed for the event, how we both walked over straight from work (so we arrived a little early), and other NYC events we have participated in and/or fundraised for, for example, the NYC Triathlon, the NYC 1/2 Marathon, and Midnight and Color Runs. She was well prepared wearing cargo pants with many pockets, and many layers underneath. She gave me her extra pair of earplugs, saying I would need them. I never thought of using earplugs, so I was gracious. Soon after, people from her Team “Cushman and Wakefield” arrived and were all very personable and cool. We discussed how we heard about the event, whether we had done it last year, whether we would be able to sleep or not, if we are able to sleep on airplanes, our experiences fundraising, how nice the event is, about the center, the bravery of the teens, and how great the turnout was. So far, so awesome. It was one big party and social gathering. They made the event very comfortable and very fun. 8:30-9:30: Introduction by the staff, about the center, how the night will unfold, the amount raised, gratitude and prizes for the top fundraisers. 9:30-10:30: We broke off into groups for a special project and met with some of the youth living at the center. We introduced ourselves, and learned about their life circumstances, how they found out about “The Covenant House”, what brought them there, and what their experiences have been like. Due to confidentiality laws, we are unable to discuss them, their situation, or photos, however, I was impressed with how brave, intelligent, good natured, and motivated they seemed to be. 10:30-11:00: Each group shared their projects with the other small groups. Our groups assignment was to make a poster representing “Healing”. We cut out photos and phrases from magazines which gave us healing thoughts, and pasted them on to a poster board. The women definitely dominated making the poster, while the men in our group were only allowed to draw a small basketball as their contribution. It was very funny. 11:00: The entire group met back in the conference room, and a few other residents spoke about their life experiences, how they arrived at the center, how their lives have transformed, and their motivation to stay on the right path. Again, due to confidentiality laws, we are unable to discuss their situations, however, the stories were all very moving, and brought me to tears. 12:00: The time has come to grab your box or boxes, claim your plot of concrete, and create your bed for the night. My plot was definitely nice, as I was facing their beautiful wall mural, was close to the door if I needed to go inside (the doors were open all night if you needed to use the restroom, and snacks and beverages were available any time). I had one box cut open lengthwise so my entire body was insulated, while another box was opened and folded (like a box is intended), and positioned like a fort covering over my head to block the wind. Although you weren’t supposed to, I unrolled two sleeping bags, used one for insulation and the other to sleep inside. My head was pretty warm, as I was wearing two hats. The large flood lights stayed on until about 12:30pm, and then smaller lights stayed on all night in the event anyone needed to get up and go inside. The security guards remained at the front entrance all night and the weather cooperated. Considering there were many Artic Vortexes over this past winter, the temperature that night was mild around 40 degrees, while the temperature for Saturday was predicted to reach 63 degrees with a low of 34 with possible showers. Relatively speaking, it was definitely not too cold. 40 degrees F, now feels like Caribbean weather, and where my cardboard box was stationed, it was not too windy. My neighbor and I introduced ourselves. I put the ear plugs in, slid myself into the sleeping bag and the box fort much like a mechanic would slide under a car, and tried to sleep. My lips were quickly getting dry, my body dehydrated, the sound of the trucks that reverberated every time they hit a bump or a pothole, sounded like an explosion even with the earplugs in, the warmth from the insulation lessened at around the 3am hour, and all I could do was think about those who go through this every night. Of course, giving consideration to the brave teens, but also, the mothers with young children, veterans, and those with mental illness or drug or alcohol addiction. At around 4am, I did start to hear people leaving the bars, and I did get a little nervous, as we all know what drunk people can be like at 4am. All in all, for someone who is usually able to fall asleep at a baseball game or a rock concert (if I’m tired enough, not b/c the game or concert are boring), I probably only slept for one hour. It was definitely harder than I thought it was going to be, however, it allowed me to reflect on a population that is so often ignored and disrespected, and give gratitude to all the people who have helped me get through life. 5:30am: Wake up. Beautiful assortment of bagels, croissants, fruit, hot and cold drinks, and discussion. Sleepers stood up and discussed their experiences. Become a volunteer or a mentor. There is no shortage of people who need guidance. Thank you to those who donated. The 17 year old New Zealand native, “Lorde” started her 3 night run at the soon to be closed, “Roseland Ballroom.” After eight decades of hosting entertainers including; Fred Astaire, Joan Crawford, Ray Bolger, Arthur Murray, Rolling Stones, and Madonna, the venue will be closing it’s doors after the 7 Lady Gaga performances, March 27 to April 7, 2014. 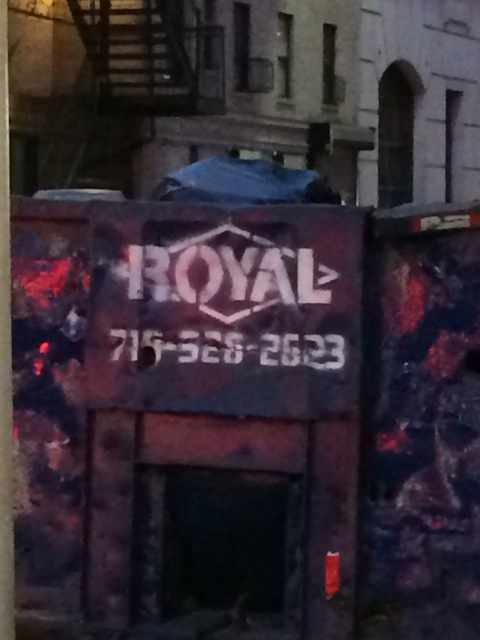 Ironically, on the way in to the concert, there was a homeless person dumpster diving in a ‘Royal’ owned trash bin, and a scalper trying to sell tickets. The majority of the fans were screaming teenage girls, similar to the J.Law fans. Adorable. Her performance started at 9p and finished approximately by 10p. Bring your teenagers, neighbors kids, or nieces to tonight or tomorrow night’s shows. You are currently viewing the archives for March, 2014 at One World Cinema.